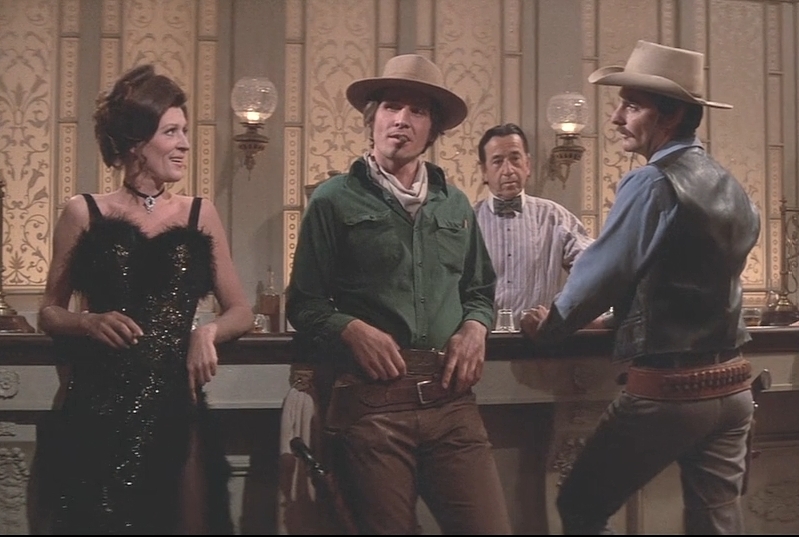 Westworld from 1973 (not to be confused with the HBO series of the same name) holds a special place in cinema history. 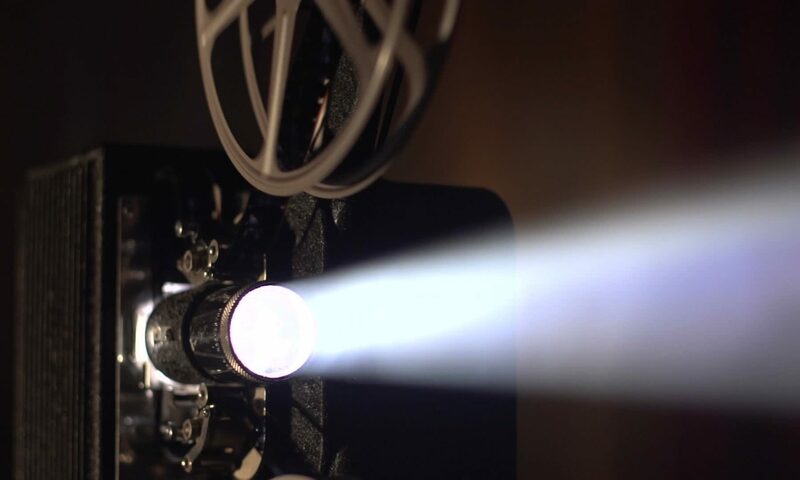 It was the first feature film to use digital imagery of any kind. However, Westworld is more famous for being the directorial debut of writer Michael Crichton who is most famous for writing the novels Jurassic Park and The Lost World two decades later. Westworld may not be the spitting image of perfect cinema, but it is enjoyable and, for fans of Crichton’s science fiction works, definitely worth a look. Westworld is a science fiction thriller and Michael Crichton’s directorial debut. Crichton would later write that he did not wish for his first film to be science fiction but that “it was the only way I could get the studios to let me direct.” The story and script were written in 1972, making this a rare Crichton production that was never written in book form first. Crichton and producer Paul Lazarus III proposed the film to every major studio who each turned them down except for Metro-Goldwyn-Mayer (MGM) who granted them a budget of $1 million and no control over casting. The budget was later increased by $250,000 as production advanced. The film was released the following year to a generally positive reception, making around $10 million at the box office and becoming MGM’s biggest box office success of the year. Crichton would later return to direct several other films including Coma and the film adaptation of his novel The Great Train Robbery. Two friends, Peter Martin and John Blane, who is a returning visitor to Delos, have signed on to visit Westworld. At first it’s all fun and games. However, it becomes increasingly clear that the Delos androids might not be as safe or in control as many once believed. Westworld builds very slowly. The first third of the film is mostly just introducing the Delos facilities, providing some background for the characters and technology and watching several of the characters interact with the androids in their respective “worlds.” The second third is more about showing the park’s gradual decline to chaos. However, where the film really stands out is for the third act. 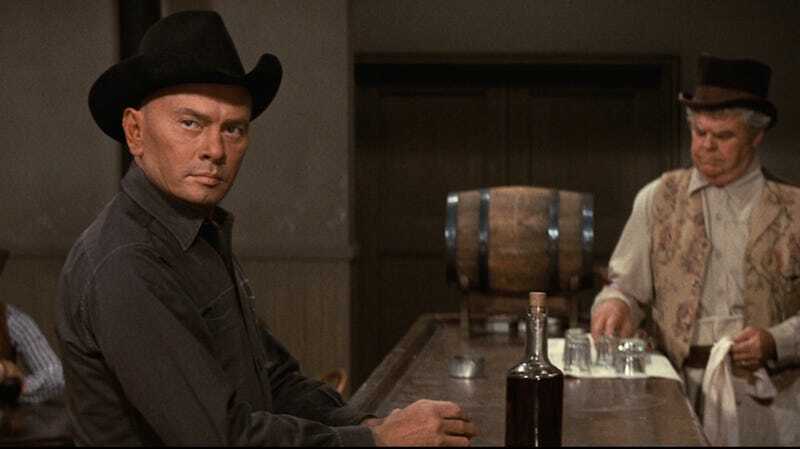 You see, throughout Westworld, the main characters confront “The Gunslinger” (portrayed remarkably well by Yul Brynner) an android designed to challenge guests to duels to the death. When the robots all run amok (spoilers) the film quickly turns into a game of cat and mouse with the gunslinger ruthlessly pursuing Peter Martin. As with the rest of the film, it’s slow moving but gripping. The gunslinger is shown as being nigh unstoppable, designed to be the perfect killing machine. This is one of the areas where Westworld is interesting. On the surface, it might seem like a rip off of The Terminator with a western theme…until you realize that this film predates that one by over a decade. The film also utilizes a very similar structure to what Crichton would later use in another amusement park run amok story, Jurassic Park. I mentioned above that Westworld is a slow film. It is, but it’s never boring. From the beginning, there is a palpable tension and awe to the whole thing. On top of that, Peter and John are both likable characters, and it’s fun to just watch them interact with the world they’re in. Yes, there are the two other worlds in the park, but about 60% of the movie is set in West World, which looks fantastic and really captures the mood of an old Spaghetti Western. It all concludes with a rousing third act. Westworld’s finale might seem a tad tame compared to later killer machine movies but, if taken by its own merit, it is suitably intense and exciting to make the rest of the film worthwhile to make it through. Admittedly, much of this has to do with Yul Brynner’s incredible performance. He really sells the concept of a adept killing machine with no remorse and that can’t be reasoned with. The pacing for this sequence is also, suitably, slow which really adds to the sense of tension and claustrophobia that the sequence is going for. Now, it might seem like I’m praising this film up the wall. Westworld is a good movie, but it does have a few problems also. As I watch it more and more, some of the scenes can feel like pointless filler. I can tolerate it, since they are at least shot and written well and help the audience to see what the appeal in the park is, but it’s worth mentioning. However, aside from Peter and the Gunslinger, character development seems lacking. There are other visitors in the park that we watch from the beginning. Some of them are played to be repulsive while others are more for comedic relief. That’s all fine and good, but some of them get far to focused on without giving any satisfying finish to their story ark (the West World visitor in the glasses being the main culprit…he just disappears right before the third act starts). There are also several scientists that see from time to time managing the androids from behind the scenes. The topics they discuss are interesting, but they also don’t feel very developed. They fall into the camp of “greedy capitalist” or “weak realist” and aren’t terribly memorable. Overall, though, Westworld’s strengths do outshine the flaws which, in all honesty, I didn’t really notice the first few times I watched it. As stated before, the film’s solid writing, acting and fun portrayal of the wild west really carry it until the final act, which is worth watching the rest of the movie for. How are the Effects in Westworld? Special effects are, surprisingly, minimal in Westworld. Sure, there’s the expected blood spill whenever a character is shot or stabbed (which looks like it always did in 70s movies…like red paint) among other things, but most of the movie is surprisingly actor focused for something with its premise. As a whole, there are only 3 visual effects I can think to talk about. One of them is a bit on the underwhelming side, one is interesting and one is legitimately impressive. Putting the worst first, at the beginning of the film, we see a hovercraft carrying the visitors into the park. We never see the whole craft, with most of the scene focused either on interior or images of it on monitors, but it fails to impress. There are two shots where we see the scenery on the pilot’s shades, which is neat. However, beyond that, the movement of the terrain feels unnatural and the craft itself (when we see it) feels to flat and misplaced in the shot. I mentioned earlier that this Westworld the first film to use any kind of digital imagery. That’s true, but we don’t really see any of it until the final act, and it’s only used a few times to give us a POV from the gunslinger with his vision being shown as pixels. It looks fine, and gets the point across, but doesn’t stand out as anything remarkable today. Where the effects in Westworld really shine is in the android effects, particularly on the Gunslinger. Several times, during maintenance, we see the androids with their faces off (probably the most famous image from the film) and it’s actually pretty convincing. Beyond that, Westworld’s final act shows the Gunslinger being gradually dismantled in its battle against Peter. Though perhaps not remarkable, the effects of its gradual disintegration are convincing enough to not be distracting and actually look pretty decent. How is the Soundtrack in Westworld? Westworld’s soundtrack is really a mixed bag. As you know if you’ve followed some of my earlier reviews, a film’s soundtrack is really important to me and, the fact is, this one fails to impress overall. The sequences in West world itself are decently done, feeling very western and fitting the mood even if they’re not terribly memorable. Where the ball is really dropped is, sadly, during the film’s climax. Fortunately, much of it is music free (which really helps the tension) but when music does play it’s repetitive, annoying and distracting…at least to me. I’ve watched it with people who didn’t mind the music during this sequence, but no one thought it was very pleasant to the ears. Is Westworld a Good Movie? Westworld is a good movie that’s definitely worth a look. I would recommend it strongly if you enjoy Michael Crichton’s science fiction work or are interested in the idea of The Terminator meets a spaghetti western. On top of it all, the film is really carried by Yul Brynner’s mesmerizing performance, so it might be worth it just for that. 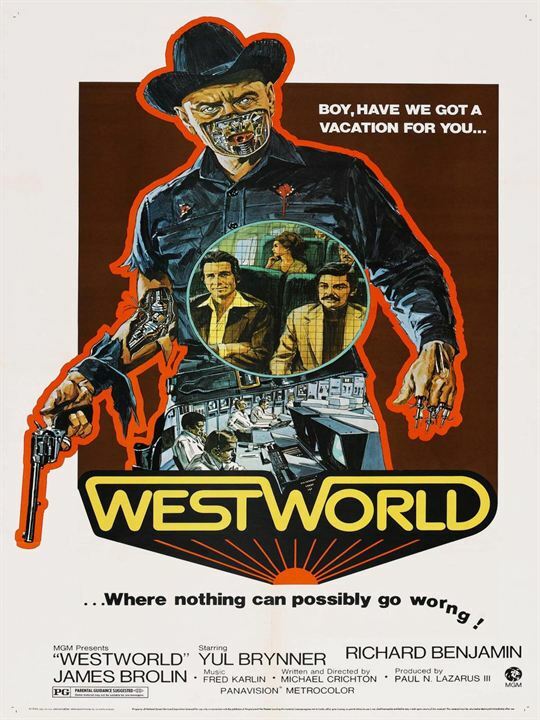 I doubt that many would consider this their favorite film, but I think most people that have seen Westworld are glad that they did.